More than a few eyebrows were raised last year when two Native American brothers were removed from a college campus tour in Colorado. The Colorado State University incident drew comparisons to racial profiling incidents happening across the country. But it also was the impetus for a new initiative put together by interested parties and spearheaded by the American Indian College Fund. In April 2018, brothers Thomas Kanewakeron Gray and Skanahwati Lloyd Gray, from New Mexico, visited the campus of CSU in Fort Collins. They had previously said the school was their top choice of universities. During the tour the two brothers were pulled away from the group by campus police and patted down. Police said a mother who was on the tour had called 911 saying she was worried because the brothers were quiet and wore dark clothing. “The Gray brothers were confronted, detained, and searched by CSU police, leaving them humiliated, scared, and literally marginalized,” said the Grays’ attorney Sarah Hinger of the American Civil Liberties Union in a statement. “This exercise of sanctioned police power magnified and legitimized the bias of an individual and created an injury beyond what a private individual could inflict alone. It is imperative to revisit both policy and training if the university hopes to prevent its police from being used as a tool of bias in the future,” she said. Hinger described the situation as an example of a “bias based” report. The school responded by offering to pay the Grays’ expenses for their trip and promised to take steps to prevent a similar situation from happening again, including the use of badges to identify guests on future school tours. “CSU has repeatedly expressed its standing invitation to the Gray family to visit our campus to discuss the progress that has been made and the ongoing work underway … We deeply respect their desire to ensure a more welcoming and supportive climate for Native people at Colorado State University …,” a CSU statement read in part after the incident last year. Dina Horwedel, the director of public education at the American Indian College Fund, said the CSU incident set the nonprofit into action. It organized an initiative to address social issues Native Americans face on campuses in order to make the environment safer and more welcoming for Native people. 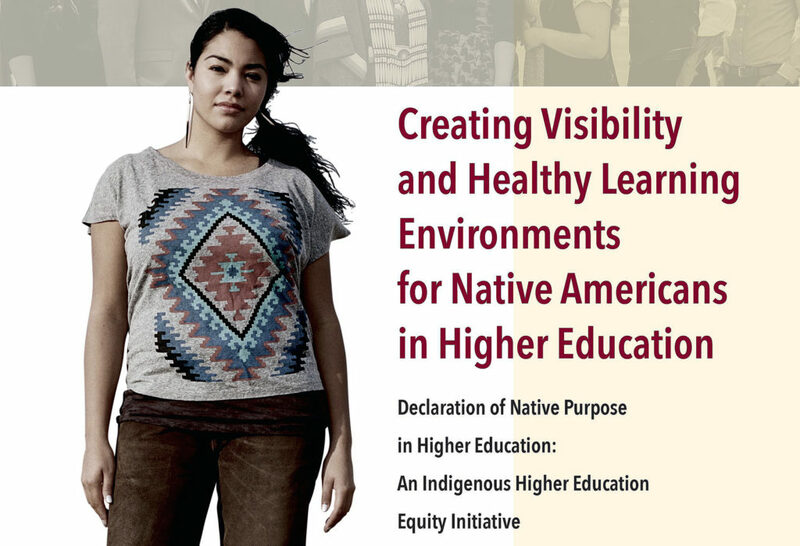 It was crafted at the Indigenous Higher Education Equity Initiative in Denver last August, an event that was hosted by the College Fund in cooperation with leadership from CSU. The report highlights “scalable steps” in regard to recruiting, financial aid, student orientation, recognition of Native lands, curriculum creation, establishment of meeting places for Native people and work with local tribes. “The CSU incident is what spurred the initiative, however, over the years, of course, many of our students have reported other incidents, and in the current climate we decided we needed to take action as it was obvious that things had not improved for Native students,” Horwedel wrote in a February email to the Seminole Tribune. The College Fund points to reports that American Indians and Alaska Natives (AIAN) face a college access and completion crisis. Only 14 percent of AIAN people age 25 and older have a college degree – less than half the number of other U.S. groups. increase the number of Native Americans with a college degree, resulting in increased opportunities for graduates, their families and communities,” College Fund officials said in a statement.To learn more about the College Fund and to download the report,go to collegefund.org. You can also request a printed copy by emailing info@collegefund.org.